This brooch is best known for its association with Queen Elizabeth The Queen Mother, but its history goes back to the mid-19th century. According to Hugh Roberts in The Queen's Diamonds, it belonged to Queen Mary's mother, Mary Adelaide, Duchess of Teck (1833-1897), and may have been among the jewels she inherited from her aunt Princess Mary, Duchess of Gloucester. 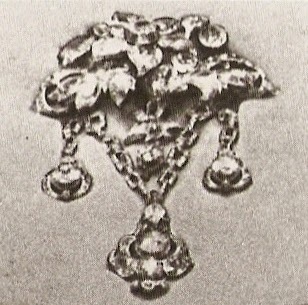 There is a central brooch with fairly large individual diamonds set in a floral design and a series of four pendants that hang below, the longest one hanging from a diamond chain. The Duchess of Teck's will left the brooch to her eldest son, Adolphus (according to Roberts), but it ended up with Queen Mary. Mary gave it to her son, The Duke of York, to give as part of his wedding gift to his bride, Lady Elizabeth Bowes-Lyon, in 1923. 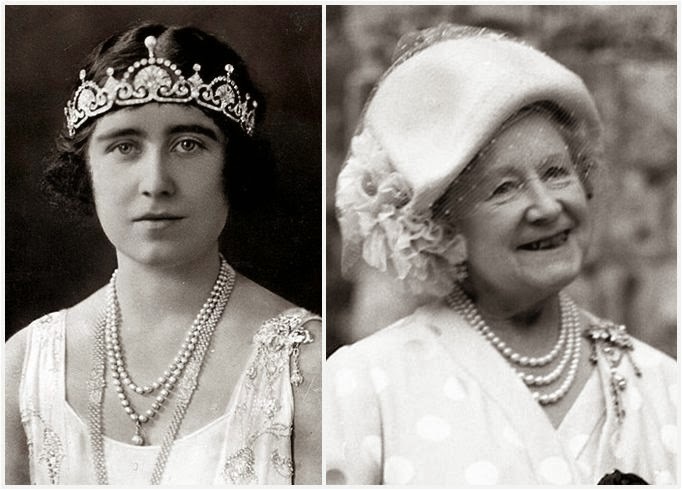 He also gave her a pearl and diamond necklace of a Greek key design which was later transformed into the Lotus Flower Tiara she is wearing in the left photo above. During her early days, as Duchess of York, she was pictured wearing this brooch in a series of formal portraits with tiara on. In her later years, it became a favorite choice for her day engagements. Following The Queen Mother's death in 2002, it was inherited along with the rest of her property by The Queen. 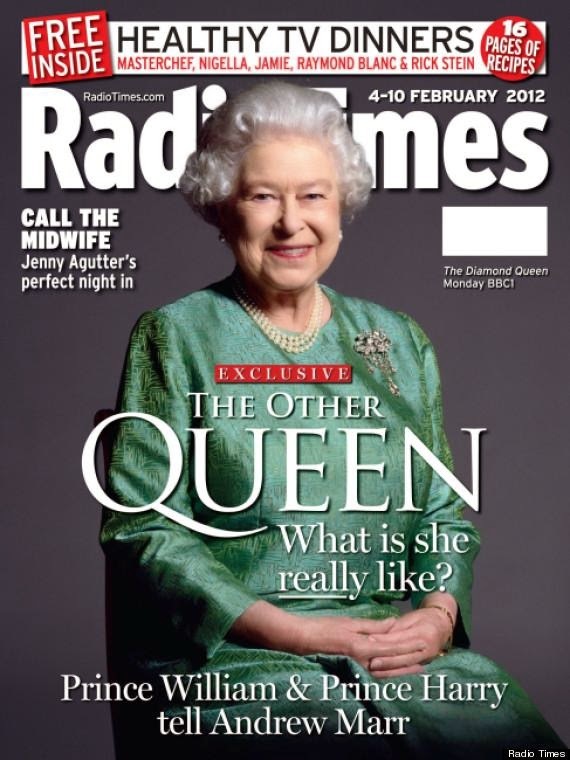 It has not, however, become one of The Queen's favorites. I believe she has worn it just once so far, for a portrait by Lord Snowdon (pictured on the magazine cover above). That's probably not too surprising, since brooches with complicated pendants are among the things that she tends to avoid these days.